Hazel with a poster presentation of her work at the CONNECT Review in May 2017. Hazel Murray, a PhD researcher under the supervision of Dr David Malone at CONNECT in Maynooth University, has won the Best Student Paper Award at the 28th Irish Signals and Systems Conference (ISSC) in Killarney, Co Kerry. 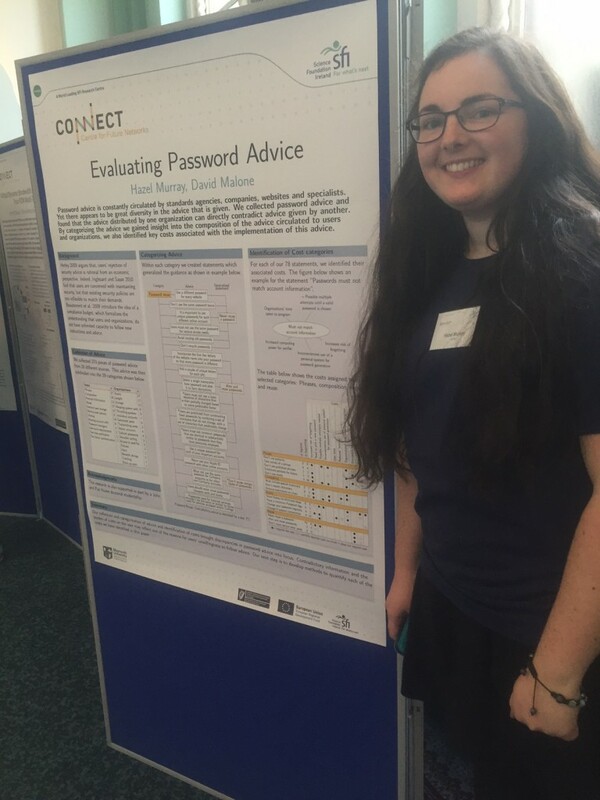 Hazel’s paper entitled “Evaluating Password Advice” examines the advice currently given when creating a password online. This advice varies widely from website to website and Hazel’s paper explores common threads while also creating a framework for identifying the costs for businesses associated with implementing this password advice. Through this methodology, the paper lays out reasons why password advice is so often ignored by users. The Irish Signals and Systems Conference has been running for 28 years and is the premier conference in Ireland for addressing all issues related to signals and systems. This year it was organised jointly by the Institute of Technology Tralee and the Cork Institute of Technology. The event consisted of keynote addresses from world renowned speakers from industry and academia and over 50 oral and poster presentation. Prof. Dirk Pesch, CONNECT Principal Investigator at Cork Institute of Technology, was a c0-chair for this year’s conference. Mariusz Wilk, a researcher at CONNECT in Tyndall National Institute in Cork, was the runner-up in the same award category.